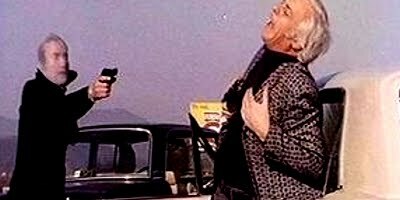 Director Umberto Lenzi delivers more of a mobster movie here than a poliziottescho, yet the results aren't disappointing. Blowhard protagonist pimp Antonio Sabato snarls rather humorously throughout and flashes a wardrobe of peach and strawberry sherbet silk shirts. Prostitutes are the currency of the day, as a French rival gang to Sabato's outfit decides to take over the street action. This along with some heroin shipments to complement the trade. But Sabato, who refuses to stop reminding people he's Sicilian, is as ruthless as his adversaries, especially when it comes to roughing up women. Highlights include some aesthetic cutaways of an octopus during the attempted drowning a whore, lots of boobies, and one gangster gets his pee-pee repeatedly electrocuted. More than anything, there's the trademark ensemble of misshapen Italian faces; always a signature of a Lenzi crimer. Some credible action on display, but the movie is paced more appropriately as a mob saga than something tighter like Lenzi's superior Milano Odia. Too bad because as a mob saga, it is sadly empty and features characters with no redeeming value. Sabato may delivers some effective Maurizio Merli smacks but fails in the charisma department. This well-shot movie has a variety of interiors, including a casino, and some nice exteriors of Catania. Also included with the humiliations of the female cast, we get an obligatory transvestite prostitute roughing-up scene. The score is garbage.